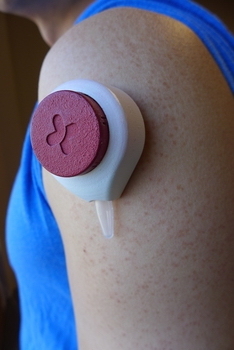 The simple device can extract small samples of blood within two minutes. The device, roughly the size of a pingpong ball, can extract a small sample while held against the skin for two minutes. Photo by David Tenenbaum. A small startup known as Tasso Inc.(Madison, WI) has taken on the project of developing a blood sampling device that is less painful, quicker, and more convenient than today's current processes through the development of a device the size of a pingpong ball. The technology extracts a small sample of blood while being held against the skin for two minutes. A slight vacuum enables the blood to flow into an attached sample tube, which can then be processed in a lab. Users report that the process is nearly entirely painless, according to a university news release. Ben Casavant, vice president of operations at Tasso, says that the technology relies on the forces that govern the flow of tiny fluid systems, or more specifically, surface tensions rather than gravity. The surface tensions help keep the blood in the channel no matter how the device is held, providing a simple, effective process for blood sampling. All three founders of the technology studied microfluidics at the university, which helped pave way for an eventual prototype. The company, which just received an additional $3 million from the Defense Advanced Research Projects Agency (DARPA), has already begun applying for a patent on channels that create capillary action to move blood toward the sample tube. As many diabetics know, the search for less invasive, and ultimately less painful techniques for blood sampling and glucose monitoring remains critical. Earlier this year, researchers from the University of California, San Diego developed a concept involving a temporary tattoo that can detect glucose levels through the skin, proving that all avenues are being exhausted to help replace the painful finger-pricking technique that the vast majority of diabetics currently use. The group also maintains that moving the blood into open channels, rather than the traditional closed channels, will simplify the manufacturing process and cut costs, paving the way for a disposable device that only requires as few as six injection-molded plastic parts. The DARPA grant will also research on blood preservatives in an effort designed to stabilize blood samples so they can survive at least a week at 140° F and still be fit for analysis. This would enable the technology to be used to sample a range of locations without the need of expensive cold-chain transportation. The startup is even working with the National Institutes of Health to develop a technique for sampling and diagnosing HIV. Currently, the device can extract about 0.15 cm3, which is enough to test for cholesterol, infection, cancer cells, and blood sugar -- basically everything that is tested in a modern lab. The hope is that the device could help speed up processing results by avoiding time-consuming trips to labs for blood draws. For now, the group intends to continue to improve the technology, and explore different applications that can make the device more versatile and efficient. If all goes well, Casavant says, the company will send its application to FDA at the end of 2015, and begin marketing the device as soon as next year.